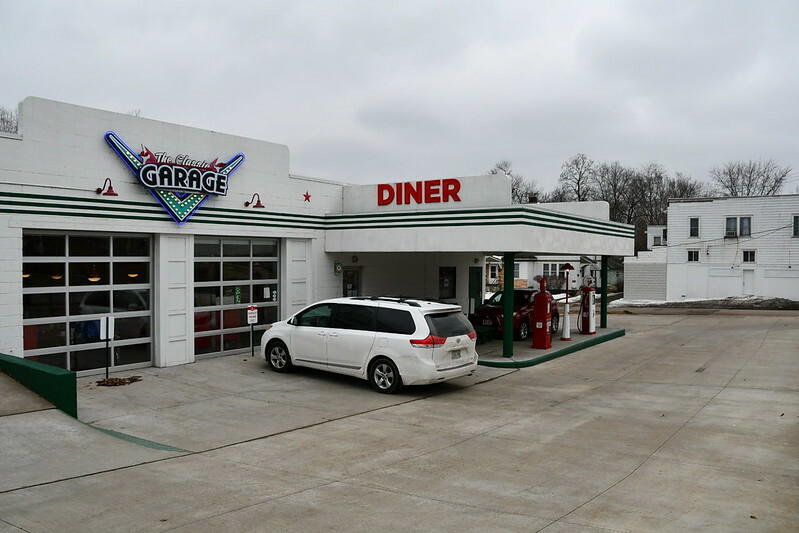 The Classic Garage is a well-executed retro diner with an automotive theme. 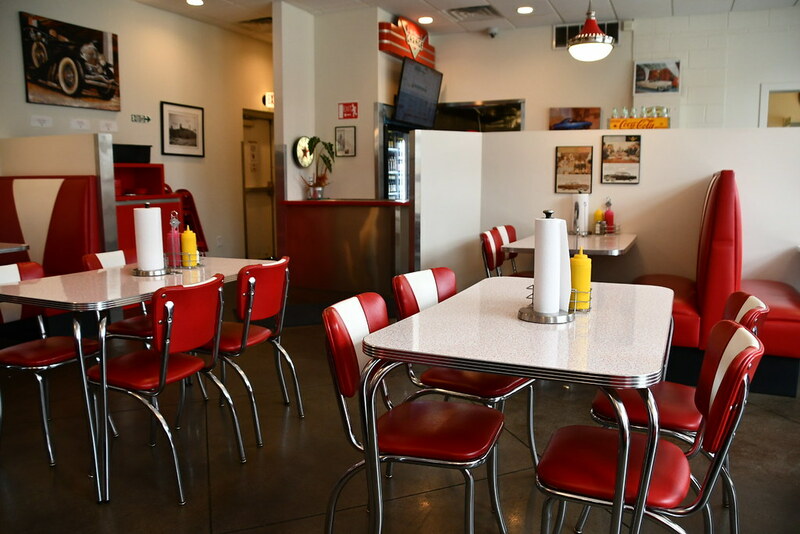 It's a beautiful recreation of a repair shop or oil change style garage transformed into a clean and sparkling diner. 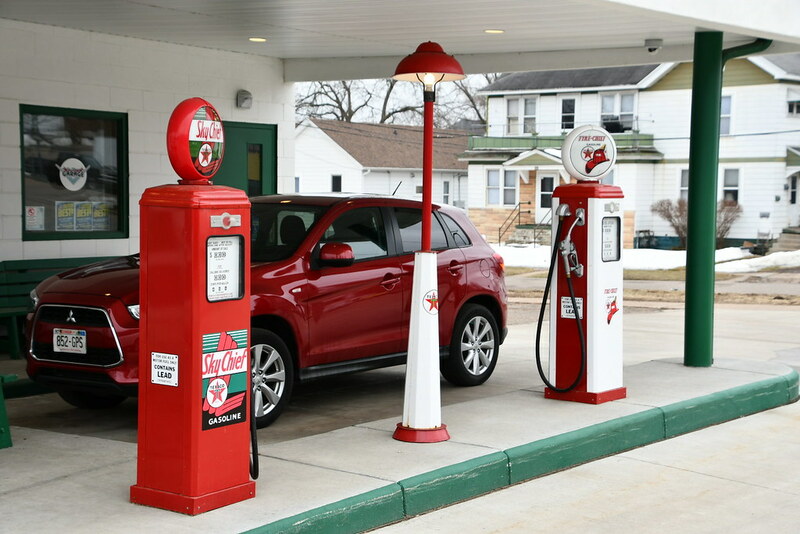 So in a sense, it's not an authentic garage because it's much too clean! But I think patrons wouldn't come back if there were really oil stains and grease everywhere, so going for "clean" was a good choice on the management's part. Unlike most diners, at this one, you enter and arrive at an ordering counter instead of being seated and given a menu. 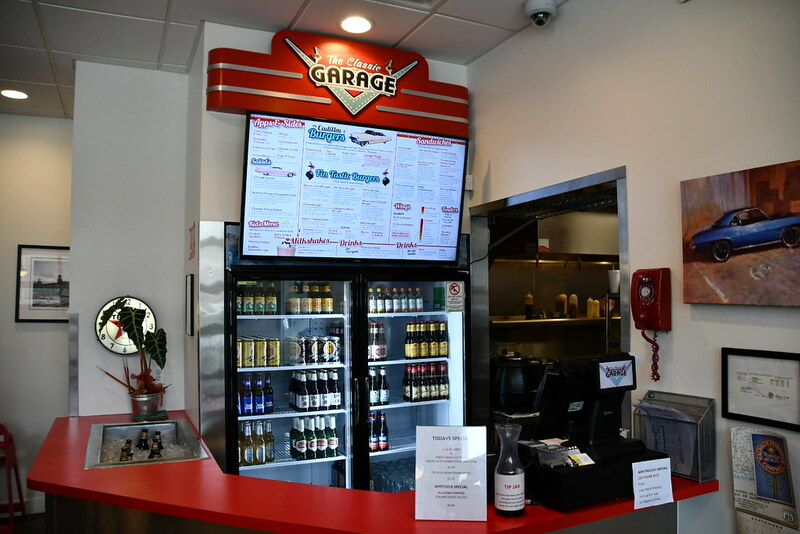 The menu is displayed on a screen above the counter. You place your order and pay for your meal, and then you are given a number to place in the number holder at a table of your choosing. The same gentleman who was taking the orders was the one running the completed orders out to the various tables, and also cleaning up after patrons who had finished their meals. After placing our order, we walked into the dining area and found a lot of people waiting for their orders. There were quite a few customers (the photo above was taken after the lunch rush had cleared out). The interior of the restaurant was very clean and bright. 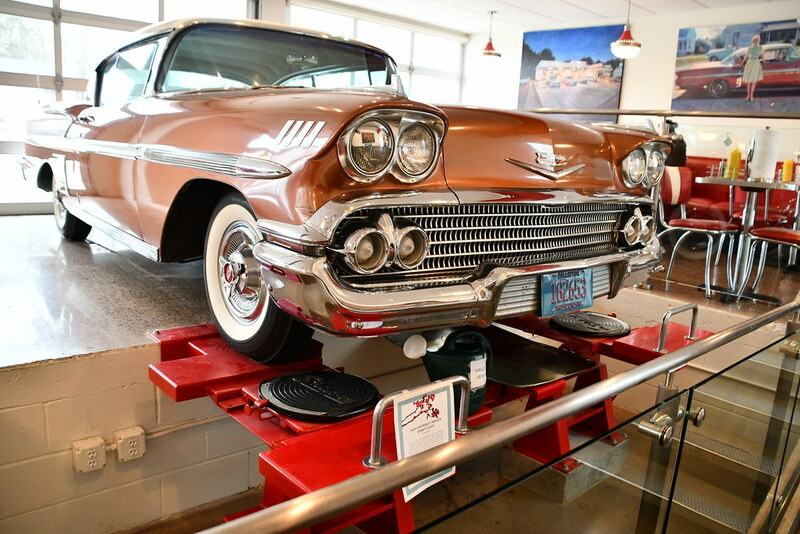 There were scattered pieces of automobile memorabilia around the room, but most notably was an old Chevrolet Impala in the middle of the dining room, looking like it was there for an oil change. I ordered the quarter pound Mushroom & Swiss burger and a strawberry milkshake. The menu board described it like this: "Mushroom & Swiss: Portobello, button mushrooms and shallots sauteed in butter and finished with a burgundy wine reduction, topped with Swiss cheese. $7.29"
Katherine ordered the quarter pound Mr. Blue burger and a special seasonal leprechaun milkshake. Her sandwich was described this way: "Mr. Blue: Portobello, button mushrooms and shallots sauteed in butter and finished with a burgundy wine reduction, topped with bleu cheese crumbles. $7.29"
The sandwiches were served with their fresh cut fries and 5 little dill pickle slices. Altogether, the meal came to $26.46, including tax. My Mushroom & Swiss was reasonably good. The bun seemed like it had been briefly placed on the grill, but it was soft and quite tasty. I really didn't notice the shallots sauteed in butter or the burgundy wine reduction, but the burger was fine, nonetheless. I could taste the mushrooms and the Swiss, which is what I expected. 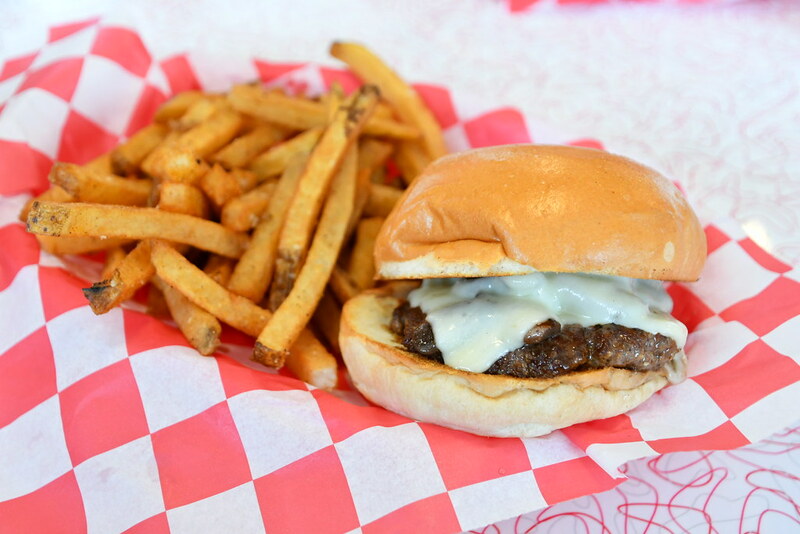 It wasn't a burger to write home about, but it was satisfying enough. The fries tasted like they had vinegar on them and were salty. I don't think I've been served fries with this particular taste before. I'm assuming it was vinegar, but it could have been something else. The strawberry milkshake was very creamy and had a nice cherry on top of the whipped cream. The milkshake was very good. Restrooms with nice service station decor, and much nicer than you'd expect from any service station. 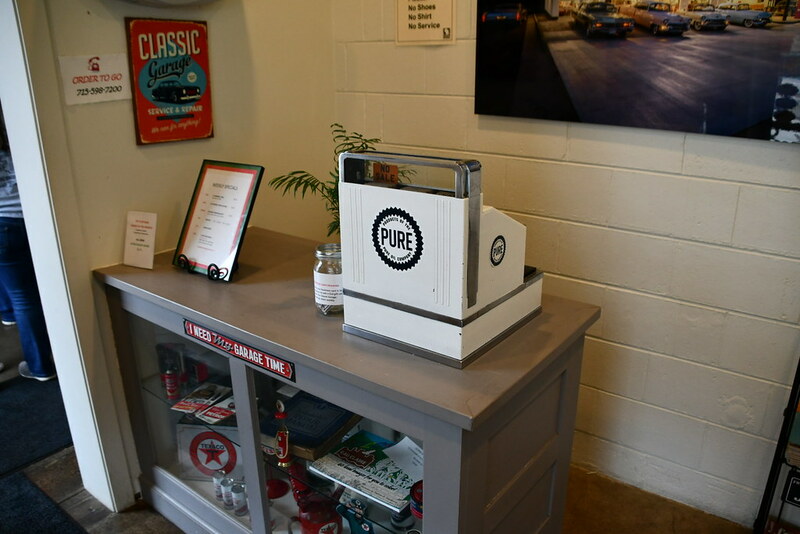 The entry area has a little counter with an antique cash register.